Two months. Hard to believe. The multimedia production guys did a fantastic job putting together a video about the trip and my final game. I’m not sure how, but they managed to make me look kind of cool! 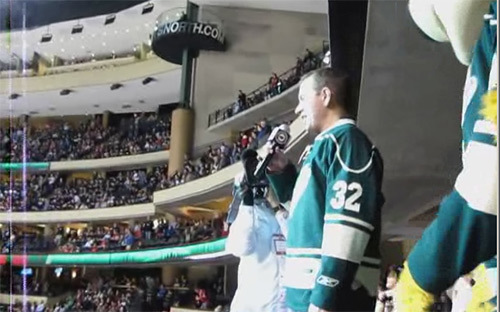 As an added bonus, I got to watch a Wild game when I came back to do the interview portion of the segment. It was my first time being in the press box at the Xcel Center, and the view of the ice was fantastic. A couple of weeks ago, I got a bunch of phone calls from excited friends telling me that they’d seen me on the evening news. They weren’t people I’d told about the pending broadcast; rather, they’d simply been watching on the right channel at the right time. That gave me a big smile. 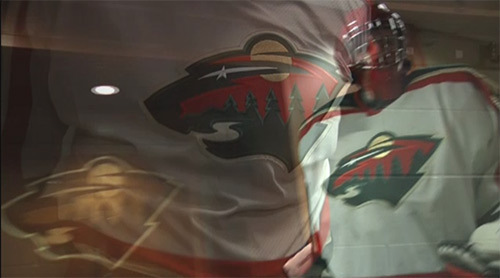 Apparently, at least two and possibly three versions of the segment existed: one that aired in the evening on Channel 5, one that aired later that night on Channel 45, and one that was posted on the web site, which appeared to be similar if not identical to the one that aired on Channel 5 (all channels in the Twin Cities market). As you know, I’m working on a book about the trip. The total length will be about twice that of this blog, which will allow me to cover topic that I did not previously address as well as give better treatment to those I did mention. That’s easier said than done. I’ve already told many of the stories in the manner that I wished to tell them, and going back to them again for revision and expansion is no easy task. I need to convince myself that what I once found satisfactory is no longer satisfactory in the new context. In other words, writing a book is hard work. It’ll probably take at least a year for me to crank it out. This isn’t going to be an “On the Road”-style bender. Long ago, back in the days when Minnesota’s NHL team was the North Stars instead of the Wild, there was an announcer named Bob Utecht. Before every North Stars home game, Bob would fire up the crowd with a call of “Let’s play hockey!” Today, that tradition continues. 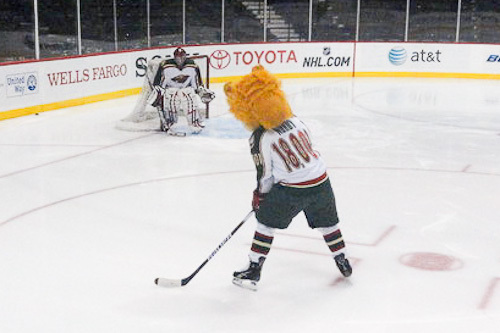 Before every Wild game, a special guest leads the crowd at the Xcel Center with a chant of “Let’s play hockey!” Sometimes the guest is a star from one of Minnesota’s other teams. Sometimes it’s a prominent politician. Still other times, it’s just somebody who has done something interesting. Last Thursday, I was that guy. What made it even cooler — as if that were possible — was that NBC filmed me leading the chant. 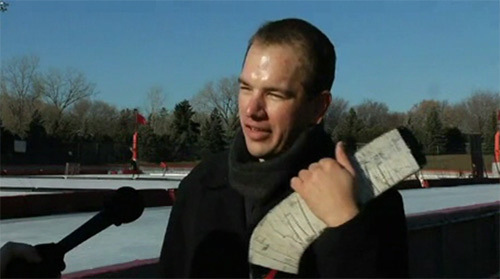 I got my three seconds of fame when NBC aired the clip during last Sunday’s “Hockey Day in America” national broadcast. Thus, as a result of the trip, I have now been on national television in both Canada and America. Score! I’m not sure if they’ll ever be put on display, but at least I know the goalie skates I used on every stop along the way will have a permanent home. How did that come to pass? Well, back when I visited the Hall in October, the manager of the archives, Craig, told me that my trip to play hockey in every state and every province had likely never been done before. He invited me to donate something from the trip to document the event. 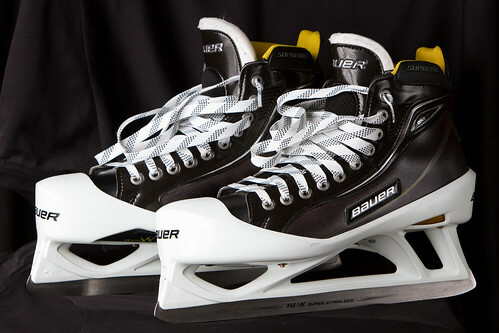 I thought about sending my favorite stick, but when I realized that I’d need to replace my skates anyway due to a lack of steel, I knew they were the better option. After so much travel and so much hockey, you’d think I’d settle down for a bit. You’d be wrong. Granted, I’ve gone from playing three or more times per week to just once or twice a week, but I’m still playing. I recognize that I won’t be able to play this most wonderful of sports forever, so I want to make the most of every opportunity I can get. I have to use my new skates for something, right? So where does that leave us? 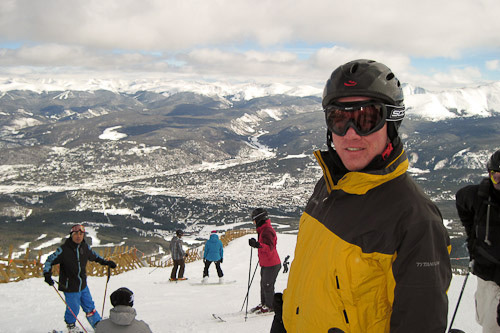 Am I living the dream in Colorado, pounding out a few pages of my book in the morning, hitting the slopes during mid-day, and writing code for my consulting client in the afternoon? No. Don’t be crazy. The best snow is first thing in the morning. “How does it feel to be done?” the KSTP photojournalist, John, asked. I was sitting up on the boards at the home team bench in the Xcel Center. It was December 20, 2011. I had just finished playing my final game of the trip, and the reality was still sinking in. 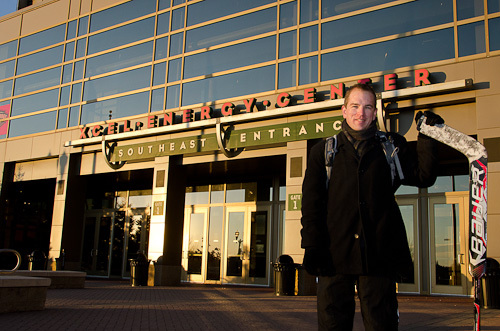 All around me were reminders of the Xcel Center’s role as the home ice of Minnesota’s NHL team, the Wild. The logos. The fantastic ice. The immaculate benches. The goal of the trip was to save the best for last, and boy, did it ever turn out that way. It had been exactly six months to the day since I began the journey by leaving my apartment in Fridley. Back then, nobody had heard about the trip. My mettle was unproven. I was just some guy with a dream. Time fixed that. Tens of thousands of miles. Hundreds of people. Dozens of rinks. Stories lived, destined to be told and retold. Interest and credibility emerged. Earlier in the day, I drove Sam to downtown St. Paul. I parked next to the outdoor skating rink at Rice Park, tossed my bag and sticks to the sidewalk, and started walking towards the X.
I strolled through the brisk air, bag in tow. It was unusually warm for Minnesota in December, but I had been so softened by autumn in the South that I found even 30 degrees to be chlly. The setting sun colored the world orange and projected long shadows all around me. It was 4:00 when I arrived at the Xcel Center. Mike and Jon from the Minnesota Wild’s multimedia staff were out in front to greet me with still and video cameras. John from KSTP showed up a few minutes later with his camera in tow. For a moment, I felt a teensy bit like a celebrity. They recorded me walking into the building — a couple of times, from different angles — and then we stopped briefly in the lobby, where I met Brad Bombardir. Absent the crowds, the Xcel Center was eerily quiet. We pressed on. In most arenas, the dressing rooms are afterthoughts: dreadfully cramped, dim, dank places, better suited to being spaces for seedy dive bars rather than preparatory dens for feats (and fetes) of athletic prowess. Not so in the Xcel Center. Mike and Jon directed me through some twists, turns, and hallways, and suddenly we were standing in a luxury hotel lobby. I figured we had taken a wrong turn and ended up in the nearby upscale St. Paul Hotel, so I dropped my gear bag and plopped down in one of the leather couches while the Wild guys sorted things out. However, Mike, Jon, and John just stood there talking with me. I looked around. It was a bit odd for a hotel to have such an expansive bathroom in the lobby, particularly without a door. The presence of some very nice wooden benches around the perimeter was also puzzling. And, if I’m honest, it was strange even in Minnesota to see people changing into hockey gear in hotel lobbies, as two other guys were. When in the State of Hockey, do as the hockey players do. I zipped open my gear bag and started strapping on my pads. Nordy must have gotten lost, too, because about the time I was donning my C/A, he waltzed into the room and started doing some sort of weird inverted back stretches on the couches. I’m happy to report that I didn’t fall! Not then, anyway. A very slow, deliberate entry to the ice ensured success. No, the fall came a bit later when I was moving around the crease and got off-balance. I just know they’re going to use that in the video segment. I just hope they don’t add sound effects. Nordy took some shots on me, and then the game began. The Wild players were on the road in Winnipeg, so the game I was in was the Wild front office staff’s pick-up hockey session. Every so often, the staff would get together and have some ice at the Xcel center for a bit of hockey. That Tuesday, I was fortunate to be invited to join them. 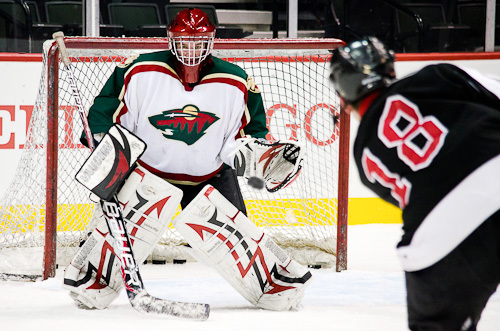 It was my first time playing at the Xcel Center. The stands were mostly empty save for the journalists documenting my trip, but I still felt like something of a star. I was glad that I had found my crested goal-cut Wild jersey back in the mid-aughts. It really helped make me look the part. Sure, it would have been fun to do something with the team at a practice or stop some shots during an intermission, but upon further consideration, that wouldn’t have fit as well with the theme of the trip. A pick-up game in a fantastic venue was perfect, and the Wild staffers were a fun group to play with. As the game progressed, I oscillated between awe and routine. I was in the Xcel Center! It was pick-up hockey. I was playing at the pleasure of the Wild! There were saves to make, shots to stop. Journalists were photographing and recording me! If I didn’t focus on the game, I’d make a fool of myself. How was it that I ended up there? I’m not sure exactly what the turning point was, but I do know that I had several people advocating on my behalf: my sister Andrea, who took it upon herself to relentlessly call the Wild office; and the Fox Sports North journalist Anthony, who started working his connections well before informing me he was doing so. Ultimately, the Wild’s web managing editor, Glen, bought into the idea, and from there flowed everything else. I’m indebted to everybody who made it possible. At the end of the session, I walked back down the same tunnel used by Backstrom, Harding, and the rest of the Wild. Young kids — squirt age — were streaming the other way, towards the ice. I towered over them by about three feet as I lumbered along. Their association had acquired the next block of ice as a special event. The little kids shouted “Go Wild!” and we tapped gloves. They were in the early stages of their own hockey adventures. Perhaps one of them would someday again walk down that hallway with a spot on the roster, but for now the motivation was not glory but simply a love of the game. As I drove away from downtown St. Paul, it finally hit me: I would play hockey again in the future, but the era of the trip was over and complete. 10 provinces. 50 states. Done. After six months and 31,000 miles, I am finally back in Minnesota. The final game of the trip is still a few hours away, but I have already unpacked Sam and begun to ease back into a somewhat normal life. I didn’t have much in the way of possessions before the trip, but the boxes I left in storage greeted me menacingly upon my return. “Open me! Need me!” they screamed. What could those things be? What could I possibly need now that I did not need for half a year? I am tempted to get rid of it all, but the window to do so is before I open those containers. After I see what’s in them, it will be too late. On the other hand, I miss using some of the things, like my nice IPS LCD monitor. Clothes, too. I also had a bunch of clothes in storage, by which I mean I have at least three more pairs of pants and a half dozen shirts. That’s a huge increase from what I had with me on the road. It felt kind of silly, but I was almost overwhelmed with the number of clothing options I had from my recently reacquired wardrobe. The surprises didn’t stop with my items in storage. The first thing I did when I got back to Minneapolis — even before I unpacked — was to change Sam’s oil. I like changing oil, not only because it’s really simple, but also because I’m leery of oil-change places. Unfortunately, I was left with few options other than Jiffy Lube in Greenville, SC when I last had Sam’s oil changed. They charged me an arm and a leg, filled the windshield washer fluid reservoir with water (that then froze in Colorado), and didn’t use the replacement crush washer I had provided for the drain plug. 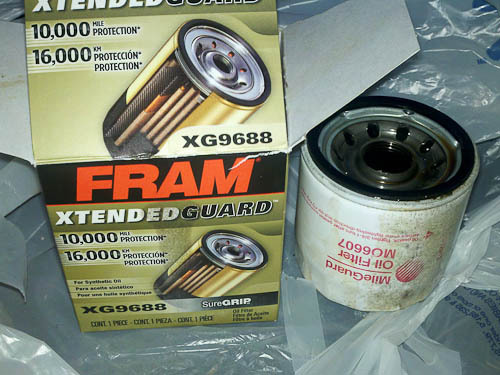 As if that weren’t enough, they left me another surprise: they used the wrong oil filter! Poor Sam. Those morons at the Jiffy Lube in Greenville used the filter for a 2.5 l Outback, not a 3.6 l Outback like Sam. That’s a considerably smaller filter. Fortunately, the outer gasket sizes were similar enough that oil didn’t leak all over the place, but I’m concerned about the reduced filtering capacity. The Jiffy Lube receipt itself shows that they used the wrong filter, so you’d better believe that I’ll pursue that if Sam ever develops any oil-related engine maladies. 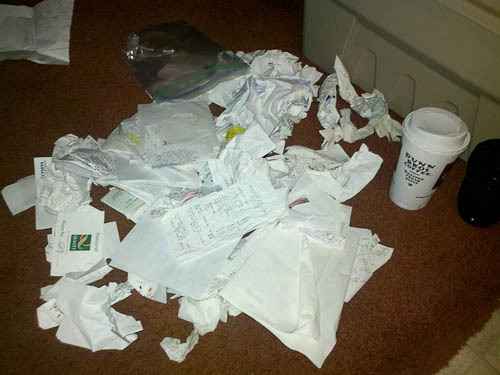 I amassed a huge collection of other receipts, too. Just some of my receipts from the trip. And a coffee. That doesn’t include the biggest “expense,” opportunity cost. I didn’t work much over those six months I was on the road, so the trip “cost” me half a year’s income. Overall, was it worth it? Without hesitation, I say: YES. Blue: states/provinces/territories visited. Red: states remaining. Gray: territories not slated to be visited. Isn’t that a thing of beauty? Minnesota is the only state I have yet to play hockey in on the trip. Sure, I’ve played there numerous times in the past, most recently on June 17, 2011, but those sessions were from before I embarked on my grand tour. For the trip to conclude, I have to play there once more before the end of the year. Minnesota’s neighbor, North Dakota, served as warm-up to my homecoming. In the original version of the trip plan, North Dakota was supposed to be the first state. Unfortunately, I had trouble finding a game there in late June, so I bumped it back to early September when I would be traversing from the western side of the continent to the eastern side. Again, there were problems finding a game on both the right day and in an accessible location, so I bumped it back as far as possible. 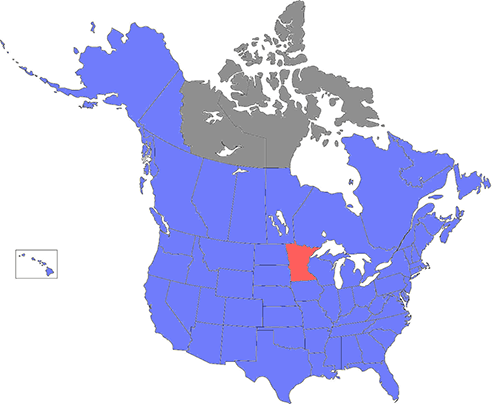 North Dakota became the penultimate state. …which sounded great to me! I always love getting connections to games. 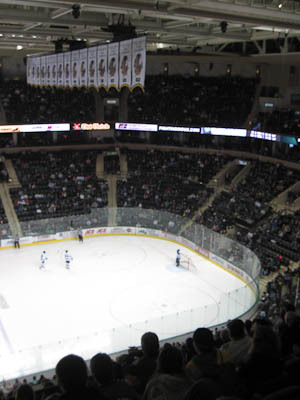 Grand Forks is not a large city, but its passion for hockey outshines that of cities ten times as big. The players at my skate were down-to-earth guys with a lot of skill, the ice at the arena was nice and fast, the employee at Hockey World who sharpened my skates did a great job, and the fans at the UND game were boisterous despite it being a somewhat lopsided exhibition contest. I’m glad my second-to-the-last stop was in Grand Forks. North Dakota worked out in the best way possible. The observant among you might have noticed that, with 2 states to go, I have played hockey a total of 68 times on this trip, spread among 65 arenas, summing to almost 85 hours on the ice. 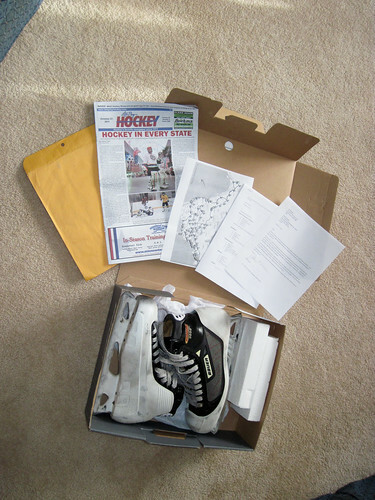 However, I have written separate blog posts about only a small subset of those skates. While I could claim that some of the ice times were too uneventful to merit full blog treatment, the reality is that I could tell you decent stories about pretty much all of them. I simply don’t always get around to it. Here’s another way to think about it. This blog is already about 60,000 words long, which is about the length of a short novel. I’ve covered only half or so of the provinces and states in detail. To do every one of them justice would require a considerable amount of additional writing. No time now, but there will be time in the future. On a more general note, I’m now in my penultimate state: North Dakota. Grand Forks, to be exact. It’s cold outside, the local hockey store has a huge selection of goalie gear, and menus at restaurants call it “pop” instead of “soda.” Clearly, Minnesota is just a slap shot away.